Artist, Radio DJ, Youthworker, Experienced freelance journalist specialising in hiphop music and culture. 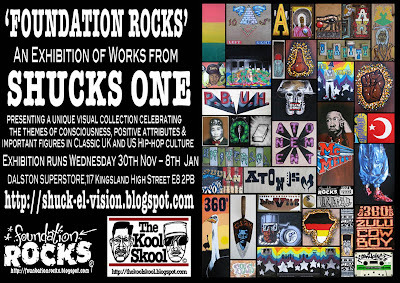 UK artist Shucks One presents a unique visual art exhibition celebrating the themes of consciousness, positive attributes and important figures in Classic UK and US Hiphop culture, discussing its wider implications on modern culture. Through painted pieces Shucks One has developed a way of expressing and contextualising the history of modern day street music and art. Using a variety of objects as canvasses, such as furniture, clothing, masks and found wood, Shucks One creates a sketchbook, a mix tape way of exhibiting work, going back to the core ethics of street music and art. Using bold colours, pattern reminiscent of tribal fabric prints and ancient symbols Shucks One discusses themes of cultural heritage. 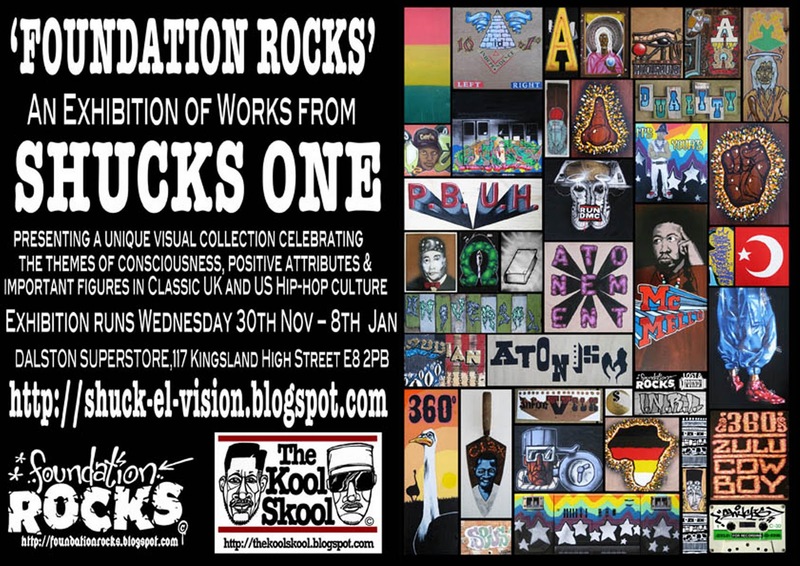 Foundation Rocks combines a series of portraits, illustrations and sculpture, capturing the original hip hop mantras of ‘peace, love, and unity; knowledge, wisdom and understanding’, presenting a challenge to the dominating themes of violence, negativity and corporatism which resonate throughout hip-hop today. The project is the artists’ search to rediscover these foundation principles by retracing the history of UK hip hop music and the individuals making it. It is an attempt to cement the originators of UK hip hop as icons for British music fans, who are often more familiar with the originators in the US. The exhibition is a visual interpretation of interviews Shucks One conducted with hip hop pioneers of the 1980s, whose music influenced a whole generation of young men and women in the UK. The works addresses issues of history, identity and religion. Shucks One will be donating a percentage of any sales made from the exhibition and will also be holding a raffle on the night of the private view to raise money for the charity WAYout. learn, edit, shoot, show their work or just exchange ideas and support each other. The Hub/ arts centre is the natural next step and is what we are currently fundraising for. Print graduate of the Royal College of Art, Jonas Ranson is an East London based artist originally from Essex. His work falls into two main categories which encompass the twin strands of both Fine Art Practice and Illustration. Recent activities have included projects as diverse as printed backdrops for ID Magazine fashion shoots, wallpapers for TENT London, Design Week, Christies ‘Multiplied’ Editions fair, Screen print workshops for Sommerset House Pick Me Up Graphics Art Fair, and design collaborations with head of menswear at Versace, designer Martyn Bal. He has also produced fashion illustration for ELLE Magazine, and has worked on various print projects with Berlin based print Gallery RISE BERLIN. Jonas is also co-curator of LINEAR B, an international group exhibition currently showing at the Stephen Lawrence Gallery, Greenwich. Jonas’s work is diverse, drawn equally to abstraction, to the world of fashion as well as it is to the ideas and symbolism of the occult and its association with the more disreputable forms of popular entertainment. Prints are achieved through treatment in both digital conversion and photographic silkscreen processes. Both detailed and abstract, the design strategy is one that combines traditional drawing and digital technique. Both his print and Illustration work is an attempt to retain and freely pursue his own conceptual ambitions artistically, but that the conceptual goals target the intended consequence of the client’s ambition.